The 230-276 Barometric Pressure Sensor is an extremely accurate and stable transducer based on the Setraceram sensing element. This glass fused ceramic capacitive sensing capsule is the heart of this environmental pressure transducer because of its inherent thermal stability, low hysteresis and fundamentally simple design. The 230-276 Barometric Pressure Sensor is an extremely accurate and stable transducer based on the Setraceram sensing element. This glass fused ceramic capacitive sensing capsule is the heart of this environmental pressure transducer because of its inherent thermal stability, low hysteresis and fundamentally simple design. The custom Application Specific Integrated Circuit (ASIC) works hand-in-hand with the Setraceram sensor to achieve long term stability and high accuracy. This circuit also allows the 230-276 to operate with as little as 5.0 Vdc excitation (optional) for remote battery or solar powered applications. 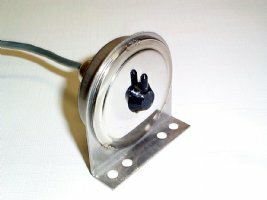 The standard unit has a convenient mounting bracket and simple 1/8 tube fitting for quick installation.